At Los Poblanos, in pastoral Los Ranchos de Albuquerque (a rural island in Albuquerque’s urban sea), executive chef Jonathan Perno cooks regularly for the inn’s guests, special events, and other private meals arranged by the owners, the Rembe family. One of New Mexico’s most passionate farm-to-table chefs, Perno sources nearly everything on his menu from area suppliers or the property’s farm. He has enough root-cellar–type cold storage to keep hundreds of pounds each of squash, carrots, sweet potatoes, and other late-fall vegetables and fruits well into February. 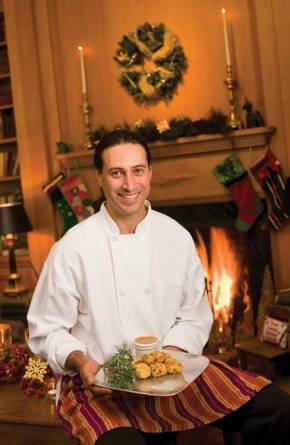 While the historic inn, designed by John Gaw Meem, remains open through the holidays, the Rembes serve no meals on Christmas Eve and Christmas Day so that as much of the staff as possible can spend the holiday with family and friends. Because Perno and his partner, Lisa Brown, grew up in the Albuquerque area, they have plenty of both to relax with on these rare days off. Thanksgiving is the holiday family meal that everyone agrees doesn’t vary, but for Christmas Perno plays with seasonal ingredients, at least to some extent. Half Italian and half native New Mexican, his favorite dishes reflect one heritage or the other, executed with polished French technique. Everyone expects homemade pasta, leg of lamb, red chile, and local late-fall fruit (like apples and quinces) but, beyond that, Perno experiments. This year he’s tasting and testing lots of the fall harvest’s shelling beans (tepary, Anasazi, cranberry, and cannellini, among others) to incorporate into dishes. One dish that remains a constant on the holiday table at his home is his mother, Annette’s, bolitos, or fried chile relleno balls. Popular at Hispanic weddings, special celebrations, and holidays, especially in central New Mexico, bolitos incorporate the flavors of meat-stuffed chile rellenos, but in a morsel easier to prepare in quantity and eat standing up. 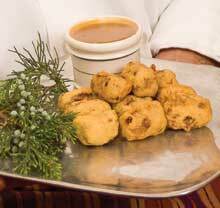 The inn’s guests can sample this heirloom recipe too, as a part of the suppertime merienda. Perno’s mother serves the bolitos without embellishment but, like some other locals, he adds a caramel sauce topping when sharing the classic dish with the inn’s guests. This recipe calls for piloncillo (Mexican sugar) and dried green chile. Piloncillo can be found at Mexican markets and is available from the Santa Fe School of Cooking: (505) 983-4511; www.santafeschoolofcooking.com. Dried green chile is available from The Shed: (505) 982-9030; www.sfshed.com/products. Place in a large stockpot the pork shoulder, skirt steak, cinnamon sticks, crushed garlic cloves, whole cloves, and bay leaves. Add water to cover the meat by 4 inches. Bring to a boil, and then turn down heat to simmer. Add salt and let cook for 2½ to 3 hours, until meats are very tender. Turn off the heat and let the meat mixture rest in the broth for 15 minutes. Reserving broth, remove the pork shoulder and skirt steak, and let sit until cool enough to handle. Strain the broth and pour 4 cups of it into a smaller saucepan. (Save the rest for soups or stews.) Add the piloncillo cones and bring to a simmer until sugar is fully dissolved. Remove from heat. (1) With a food processor or a hand or electric meat grinder, grind meats, green chile, and raisins together. (2) Transfer the meat mixture to a bowl and add pine nuts and nutmeg. (3) Begin to add the sweetened broth mixture. Add only enough liquid to moisten meat so that when you try to shape it into balls, they hold together. Adjust the seasoning, if needed, with more salt or some pepper. (4) Shape mixture into meatball-size rounds or ovals, and place on a baking sheet or plates. Refrigerate about 30 minutes, or until firm.For frying, make sure that you are using a pot that holds twice the volume of the oil so that it does not overflow. Heat oil to 350 degrees. Place flour in a large shallow bowl. (5) Roll bolitos quickly and lightly in flour, making sure to shake off the excess. (6) With the flour that remains from coating the balls, whisk in the egg yolks just until incorporated. Whip the egg whites separately to a soft peak. Fold the whites into the egg yolk and flour mixture. (7) Dip the bolitos into the batter, drain off excess batter. (8) Carefully add to the hot oil about a half-dozen or so bolitos at a time. Turn and fry until golden brown. Scoop out with a slotted spoon as done and place on a plate lined with paper towels to drain. (9) Serve warm, with caramel sauce if you wish.